Looking forward to comments from someone who has seen the book. and some more are on the way. I have had the book on pre-order at Amazon for months but the publication date has been and gone and there was still no sign of the book (even though the Amazon order status said that I should have received the book last week!!) I therefore cancelled and re-ordered via Amazon Marketplace, at a much cheaper price. I am honestly not expecting much from the book. We'll see. Mabeanie1 wrote: I am honestly not expecting much from the book. that's an intelligent attitude to have, wendy. one that will safeguard against disappointment; and contains the potential for a pleasant surprise. that's why i never look forward to anything either. How very wise you are Geoffrey. Always best to ward off disappointment. I once worked with someone who's motto in all things was "expect the worst and you won't be disappointed". Good grief, I equate those thoughts to someone who never looks forward to tomorrow, as they believe it won't be up to much. Anything is what you make it. So forgive me but I think I'll stick to my own belief and not buy anything until I am pretty sure it will be OK, rather than buy or do something blindly just for the sake of it.
' Expect the worst and you wont be disappointed ' sounds to me like cautious optimism because crucial to it is moving from the expectation to the discovery of something better . I'm going to a few Bob Dylan concerts this autumn so this could be a useful attitude to adopt during that period . I've seen this phrase way too many times & I find it to be really obnoxious, insulting, insensitive, & at this point, having been so overused, extremely trite; I think a critic, journalist, promoter, etc., should be capable of stating the positive qualities of the artist without resorting to such unnecessary, cheap, overused, unoriginal & extremely subjective comparisons. And so I feel compelled to say: let it be known, now & forever more, that Leonard Cohen is not, in any way, shape or form, "second" to Bob Dylan. With all due respect to Dylan, Simon, or any other artists mentioned in the past, present, or future, Leonard Cohen is a True Master of the Art, of the highest caliber ever, & does not need to be propped up through comparison to anyone, & is most definitely "second" to noone. I don't know if the author of the book has any input regarding how the book is advertised or promoted, but this kind of advertising, alone, greatly decreases, & maybe even completely eradicates, any interest I might have had in buying the book. I'm unhappy with this phrase as well. But you know, thousands of people start their acquaintance with Leonard Cohen from this phrase, because it's the 5th sentence of (I guess, that's the answer to your question, Rachel) the Wikipedia article. 've seen this phrase way too many times & I find it to be really obnoxious, insulting, insensitive, & at this point, having been so overused, extremely trite; I think a critic, journalist, promoter, etc., should be capable of stating the positive qualities of the artist without resorting to such unnecessary, cheap, overused, unoriginal & extremely subjective comparisons. And so I feel compelled to say: let it be known, now & forever more, that Leonard Cohen is not, in any way, shape or form, "second" to Bob Dylan. With all due respect to Dylan, Simon, or any other artists mentioned in the past, present, or future, Leonard Cohen is a True Master of the Art, of the highest caliber ever, & does not need to be propped up through comparison to anyone, & is most definitely "second" to noone. Once again, I bristled when I saw that comparison and was SO gratified when word by word by word you laid it out flat, holydove!!! Thanks for your spot on response!!! Here here Rachel! I totally feel the same. 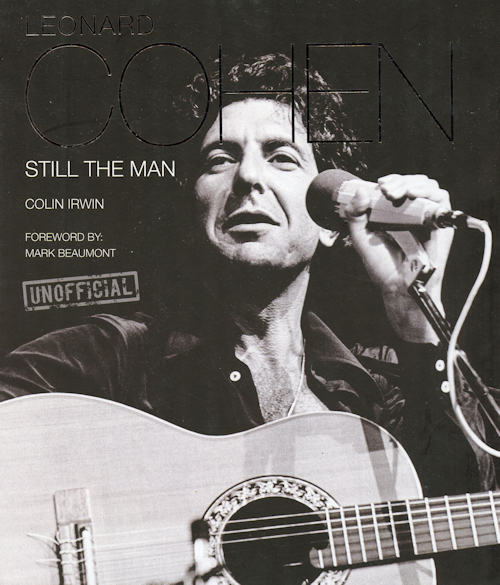 cohen comes before dylan - in my rock music encyclopedia. Thank you for your responses - Roman, Lizzy, Leslie, & Geoffrey - it's good to know I am not the only one whose blood boils every time I see that inane phrase raise its ugly head before my eyes! Roman - thanks for the link & wow, whoever wrote the promotion for this book totally plageurized (sorry for misspelling that word - I can't remember how to spell it!) a whole paragraph of that article - an article which, by the way, also states that Leonard Cohen received the "Princess" of Asturias Award !! I guess he/she hasn't heard that he's "not a women yet". . .
Vicomte, I'm not saying it's a bad place to be; I'm saying that, for me, that's not where Leonard is; & I don't think a critic or promoter should state that as though it's a universally accepted fact, esp. since it's clearly not a fact, but a subjective value judgment. Anyway, given the above-mentioned Wikipedia article, whoever wrote the promotion for the book, doesn't necessarily know much about Leonard, but simply copied something that he saw in Wikipedia! I don't know which (is worse), so nevermind. . .